Turning Up The Heat! Jason Derulo Strips Off For His Steamy Summertime Ball Set - Phew! From 'Talk Dirty' to his brand NEW number one hit 'Want To Want Me' - they were ALL in there! 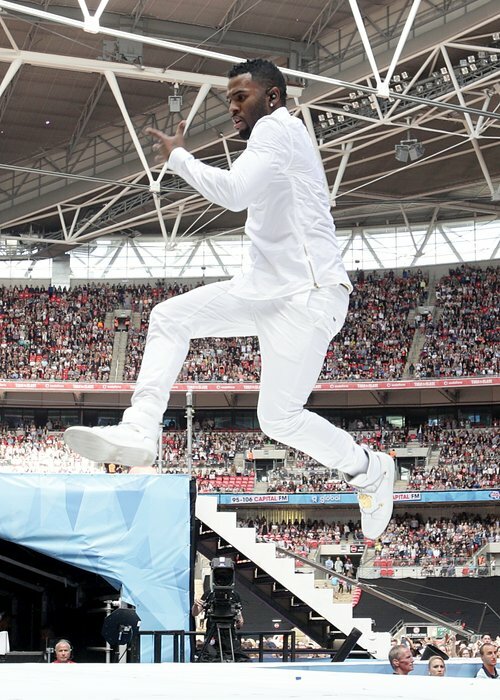 Jason Derulo somehow managed to turn up the heat even MORE at our Summertime Ball 2015 With Vodafone this weekend with a set that could ONLY be described as one thing - HOT! The US star kicked off his set with the uplifting 'Trumpets' - complete with some VERY slick dance moves - before bringing out the big-guns like his anthemic single 'The Other Side', recent Vodafone Big Top 40 number one 'Want To Want Me' and, of course, his signature hit 'Talk Dirty'! Dressed in an all-white outfit and shades, Jason bust out some UNREAL high notes and one of the most high-energy sets of the day - we're totally in awe of that body popping and those dance moves! Jason told the crowd, "I need you to show London how to turn up!" before launching into his brilliant new song 'Want To Want Me' to close hit spectacular set. It was obviously STEAMING hot on the stage as his shirt kept getting more and more open, until he whipped it off to screams from the crowd - phew! He told the fans, "I want to thank all my fans here for making this song the number one song" - you're very welcome, Jason! He exited the stage telling the 80,000 strong crowd, "Give it up for my band, give it up for these crazy dancers. Peace and love, hope to see you soon on my tour." @CapitalOfficial #STBStage JASON DERULO OMG!! !